Whether the strains of flu going around are the same ones found in the flu vaccine. If the flu strains in the vaccine are very similar to those in circulation, your risk of catching a flu is more than halved compared to people who didn't get a shot. Who you are — research seems to indicate that the flu shot works better for older children and healthy adults than for senior citizens. This also, however, varies from year to year, the CDC says. However, research shows that people who were vaccinated but still catch a flu usually have milder symptoms than those who weren't vaccinated, as well as that they are less likely to require a hospital stay. Ingredients: What's in your flu vaccine? There are two different choices when it comes to flu vaccines. There is the inactivated influenza vaccine — this one contains dead flu viruses, which means it cannot cause the flu. There is also a live influenza vaccine, which has live but weakened flu viruses. Despite the live viruses, this vaccine still won't give you the flu. Egg protein or animal cells — the viruses in vaccines have to be "grown" somewhere, and fertilized chicken eggs are often used for this purpose. However, Flucelvax, a more recently developed flu vaccine, is made by growing the viruses in animal cells. Antibiotics prevent bacteria from contaminating the vaccine. Some antibiotics used in vaccines are neomycin and gentamicin. 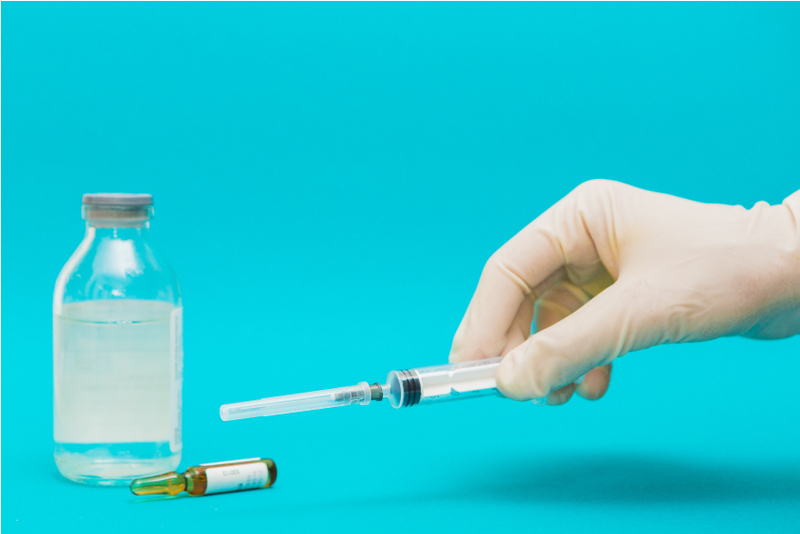 Thimerosal, which contains mercury, has a bad name — but it is very important in vaccines, as it stops bacteria and fungi from compromising the vaccine. Vaccines without thimerosal are, however, also available. Stabilizers help preserve the efficacy of the vaccine even if it is exposed to light and heat. Some stabilizers are sorbitol, monosodium glutamate (MSG), and sucrose. Polysorbate 80 is there to make sure all the ingredients are "mixed together properly". If you know you are allergic to any of these ingredients — eggs, for instance — ask your doctor which vaccines you can and cannot have before getting a shot. Any medication comes with a bunch of potential side effects, so it’s no surprise that a vaccine has it’s own handful of them. The good news is that any side effects you may experience after getting a flu shot are generally not serious and only last a few days. Some of these include swelling, redness, or soreness at the injection site, muscle aches, a headache, nausea, and — extremely rarely — a fever. Some people will feel dizzy or even faint when they receive any kind of injection, and the flu shot is no exception. Serious trouble: What rare but dangerous side effects can the flu vaccine induce? Guillain-Barre Syndrome is one of a rarest but most dangerous potential side effects of the flu shot. It is a very uncommon and painful disorder in which your own immune system mistakenly attacks your nerve cells — symptoms include muscle weakness, numbness, tingling, or painful sensations, feeling unsteady on your feet, and facial paralysis. In some cases, it can even be fatal. Guillain-Barre Syndrome can strike after a viral infection as well as, in some cases, after you've been vaccinated. This syndrome can show up two to four weeks after vaccination. Guillain-Barre Syndrome can take months to treat, and once patients recover, many still face disability and additional chronic medical issues. Older people are more at risk of suffering from this particular complication. Nerve and brain disorders — like brain inflammation, encephalopathy (a kind of brain injury) and acute disseminated encephalomyelitis (a neurological disorder). Optic neuritis, an inflammation that damages the optic nerve, potentially causing vision loss. Vaculitis, an inflammation of the blood vessels. Flu vaccine side effects: Are children more likely to be affected? Kids are more likely to encounter side effects than adults because their bodies are smaller. The most common of these is fever, which is especially likely to affect children under the age of five. While this is usually harmless, small children sometimes have febrile seizures, so it's important to reduce fevers of over 101 degrees Fahrenheit (38.5 degrees Celsius) and let your doctor know if the fever doesn't come down. Which people cannot get a flu vaccine? People who are ill — fever, weakness, and symptoms like that — shouldn't be getting a flu shot until they've recovered. Minor issues like headaches or common colds don't stand in the way of your vaccine, however. The Centers for Disease Control and Prevention recommends that (nearly) everyone aged six months and older get a flu shot every single year. This means that children under this age cannot get vaccinated against the flu yet. People who are severely allergic to any of the ingredients of the flu shot are another exception. Ask your doctor whether you can have a flu shot if you have a serious allergy to eggs or any other ingredients in the vaccine, or if you had Guillain-Barre syndrome. You should strongly consider it — getting vaccinated is one of the most effective ways to reduce your risk of catching a flu, something that keeps you and more vulnerable people around you safer. Vaccines are actually one of the safest medical treatments around. Many millions of people get flu shots without experiencing side effects worse than a little pain at the injection site. The flu vaccine is much more likely to save your life than to kill you.